The school offers a professional and dedicated staff who endeavour to deliver a curriculum which is both exciting and innovative. We have a very real commitment to the basics of literacy and numeracy. We complement this by also addressing other key areas of learning to provide a wonderful all-round education for the children in our care. St Mary's School is proud of its history of providing high quality education in an environment of the Catholic tradition. Our school is committed to meeting the challenges of education today and in the future in order to provide students with the skills necessary to progress further along the life-long journey of education and learning. Recently we had a special visit from Yohanes Baskoro from Indonesia. He spoke about the life changing project that Caritas sponsored for his village. Project Compassion’s 2019 theme of “Hope” centres on six stories that profile Caritas’ life-changing development work in communities across the globe. The stories came from Zimbabwe, Indonesia, the Solomon Islands, Australia, Bangladesh and Vietnam. Classes have been raising money through the Project Compassion money boxes and we are very grateful for your support. A special focus during this year’s appeal was on the consequences and the response of Caritas Australia to the current global water crisis. 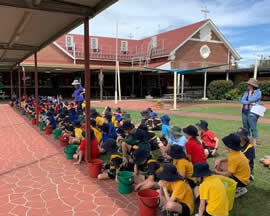 With this in mind the Year 4 classes led a 'Walk Our Way' fundraiser for the Upper Campus. 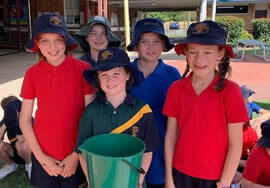 Raising much needed funds for projects in poor communities, students worked in a team and were given an idea about what carting water could be like. 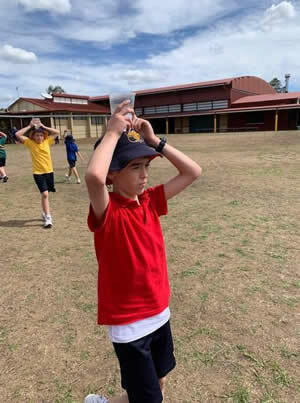 Students have been learning about life in poor communities which sometimes requires children to carry water for kilometres every day. Thank you to everyone who supported this fundraiser. The two groups featured in our newsletter collected the most water with 7 litres each. This year for Jumpers and Jazz we are planning to cover the entrances of the school with a colourful rug. We would love your help in this endeavour by knitting or crocheting colourful squares of any colours that are 38cm square. Please drop them into the office so that they can be sewn together. We would also appreciate any donations of wool you may have.